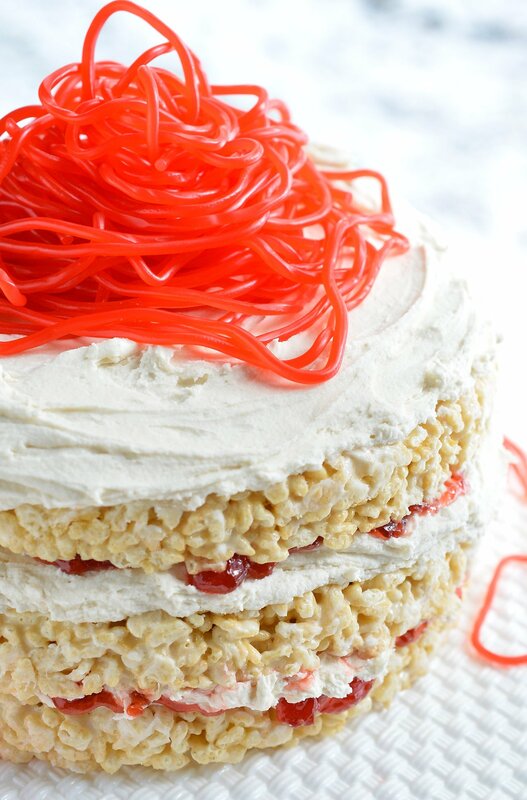 This Rice Crispy Treat Candy Cake is a fun and whimsical dessert recipe. Perfect for Valentine’s Day, kids birthdays or for anyone that doesn’t like traditional cake. 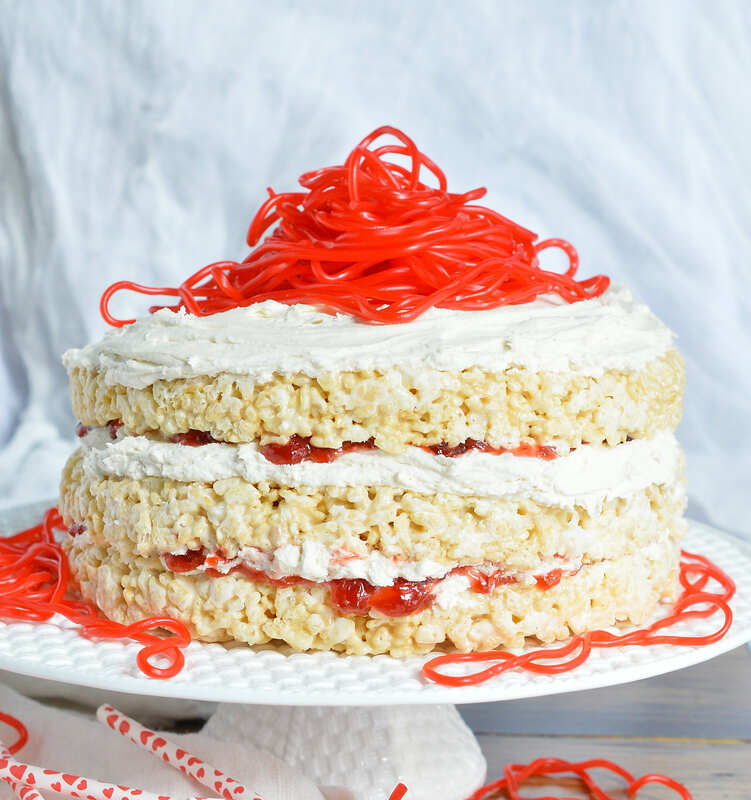 Three layers of rice crispy treats smeared with vanilla butter cream, strawberry jam then topped with strawberry licorice ropes! I was supplied product to facilitate this post. If you want to make a sweet for your sweetheart, look no further. 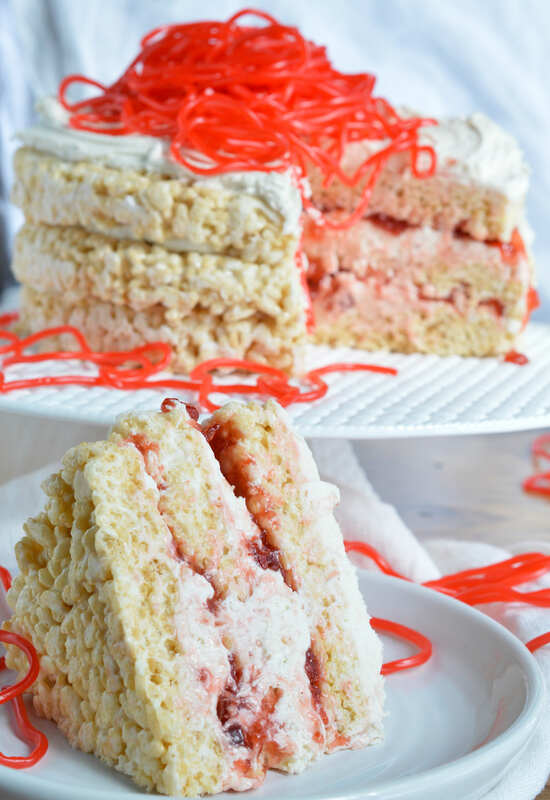 This Rice Crispy Treat Candy Cake is sweet, layered with sweet, layered with more sweet, then topped with sweets! Sometimes an over-the-top show-stopping dessert is in order. I made this for my daughter’s birthday and she was quite impressed. It also just so happens to be perfect for a Valentine’s Day dessert! My daughter enjoys regular cake but it is not her absolute favorite dessert. Last year I made these Candy Sushi for her classroom birthday treats and the kids went CRAZY for them! This year I made her this Rice Crispy Treat Candy Cake for our at home treat because we had her birthday celebration at a bakery. The kids all decorated (and ate) loads of cupcakes! Plus, I had been sent these awesome Strawberry Licorice Laces from Nuts.com and I wanted so badly to use them on a cake. If you are looking for unique candy for cake toppings and decorations, Nuts.com has so many cute options. My daughter and I recently watched Willy Wonka and the Chocolate Factory and she absolutely loved it. So when I surprised her with a rice crispy treat cake layered with buttercream, strawberry jam then topped with licorice . . . it was like something straight out of the movie! 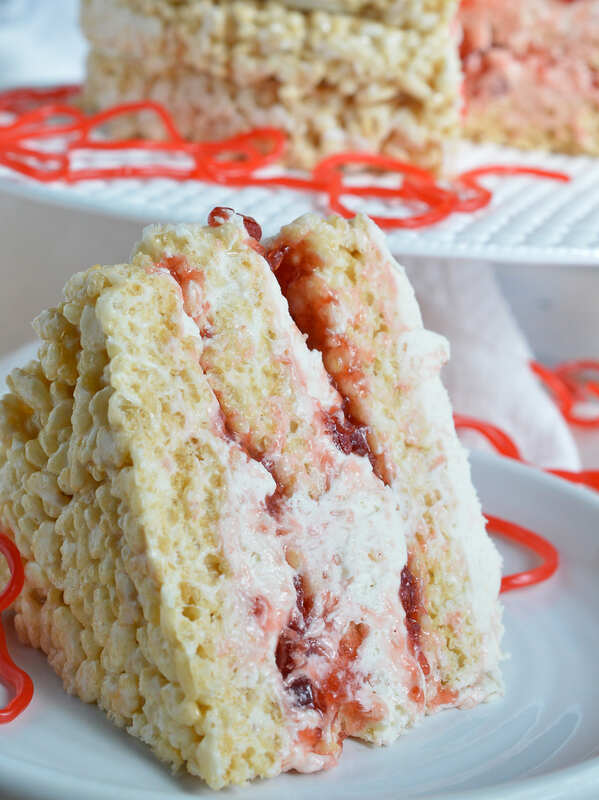 This Rice Crispy Treat Candy Cake is a fun and whimsical dessert recipe. Perfect for Valentine's Day, kids birthdays or for anyone that doesn't like traditional cake. Line 3 (8") round cake pans with foil. Generously grease with butter or shortening. Set aside. In large microwave safe bowl, microwave butter until melted. Add marshmallow and stir to coat. Stir melted marshmallows, add vanilla and stir. Immediately stir in crisp rice cereal until fully combined. 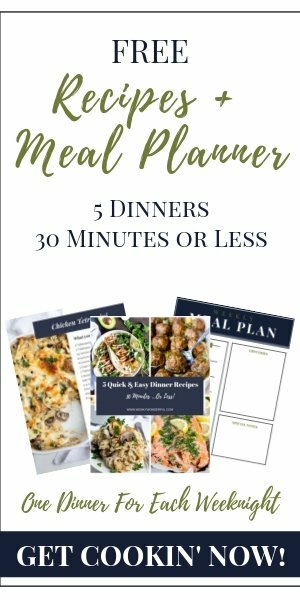 Transfer to prepared pans, dividing evenly between the three. Firmly press crispy treats into pan. Use the bottom of a cup or ramekin that has been sprayed with nonstick. Press until the treats are packed tightly into pans. Using your fingers, tuck the edges down firmly to create level layers. Using stand mixer fitted with whisk attachment, whip butter for 1-2 minutes or until creamy. Gradually add powdered sugar a half cup at a time mixing between additions. Whip on medium/high for 5 minutes or until frosting becomes light and fluffy (sometimes this may take a few extra minutes). Add heavy cream 1 tsp at a time until desired consistency is achieved. Frosting should be creamy and spreadable but not too soft. Refrigerate 5-10 minutes before frosting layers. Carefully remove crispy treat layers from pans and peel off all foil. Place the first layer on serving dish. Spread a third of the frosting on top of layer. Top with 1/4 cup strawberry jam and spread evenly. Place the second crispy treat layer on top and repeat frosting/jam step. Place third layer on and spread remaining frosting on top. Top with Strawberry Licorice Ropes. Store in a cool place until serving. *This cake requires your sharpest knife for cutting slices.